Out of stock, estimate 6/25/14 delivery!! 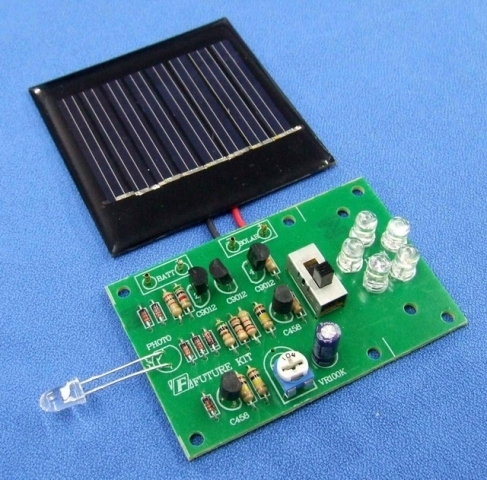 Kit includes materials to assemble a Solar powered DC Electronic 5 LED Garden Light. Five times the power of most single battery units available in discount stores. When the photo transistor senses low light condition, it turns on the circuit to the 5 LEDs. The sensitivity is adjustable. The unit can also be turned on and off with a switch on the circuit board. The unit charges 3 NiCad batteries (not included in kit, but available as an option) while sun light is shining on the solar panel. When it get dark, the unit turns on and powers the circuit from the NiCad batteries. Great for experimenting or as part of a larger project. The circuit board also can be separated into two smaller boards, one for just the LEDs and the other for the electronic circuit. Connecting the two boards with wires allows the user to put the LED lights in a remote location away for the solar panel and circuit. Solar panel measures 2.36" x 2.36" and produces 4 volts at 60ma in full sun. Circuit board is 2.7" x 1.7"
Demonstrate the power of the Sun and Learn about solar cells and LED Flashers by assembling this simple kit. Get started in the world of solar power today and have fun doing it!